The season begins on Tuesday with the Tour Down Under. This is now an established race with habitual finish lines, known climbs and even ritualised photo ceremonies. Even picking the contenders feels familiar with a strong list of local contenders keen to profit from their summer of cycling. Here’s a preview of the race with stage profiles, the contenders and pretenders for stages and the GC plus TV listings and finish times. Stage 1: one for the sprinters and beware the downhill finish. This isn’t a technical descent, it’s just that downhill finishes can see the sprinters going even faster than usual, spinning out of gears and with even less weight over the back wheel. Put simply the chances of a crash are higher. Stage 2: a lumpy stage before the sharp climb to Paracombe which featured in 2015 when Rohan Dennis surged up the climb for the stage win which propelled him to the overall win. Then the climb was the defining feature of the stage, this time there’s a lot more going before with more climbing to do as the lap around the start town of Stirling five times before heading to the finish over Norton Summit. A breather in the valley should see the teams driving hard to set up their riders for the finish. In 2015 they came downhill and had to do a tight U-turn onto the climb, now they approach in the other direction but positioning will still be crucial for such a sharp effort. Stage 3: this should be for the sprinters but watch out for the crosswinds which can split the field. A finish circuit around Victor Harbor has some lumps on the profile which are more benign than they look. Stage 4: one for the sprinters again. The downhill run to the line isn’t as pronounced as the profile suggests and there’s an uphill drag to the finish line to alter the mix of riders even if this year’s field has no dragstrip sprinters. Stage 5: The crucial stage with Old Willunga Hill. The race tours the vineyards and the coast at Aldinga. After 120km the race turns to the hills. Vineyards can evoke sybaritic notions of wine-tasting but the racing cyclist knows otherwise, the low vegetation means exposed terrain where a small breeze can be enough to split things up. Old Willunga Hill is the key moment with 3km at an average of 7.5%, a wide road with a steady gradient most of the way. This isn’t Alpe d’Huez but in a race where the overall classification is a matter of seconds, gapping a rival or taking the time bonus on the finish line can make all the difference. Normally this will determine the overall classification and the main contenders will set the pace on the first climb before giving everything on the final climb. It’s a tactical finish, being on the right wheel matters as the speed is so high, the idea is to ride the slipstream of your rival and then strike out as late as possible but before everyone else. Simon Gerrans has pounced several times on here and its one for the puncheurs. Stage 6: a criterium around Adelaide. Normally a procession followed by a big sprint but if the time gaps are tight among the GC contenders then the intermediate sprints and the finish can revive the GC battle. Simon Gerrans (Orica-Scott) is the prototype rider for this race. As proof of concept he has already won it four times too. He’s very able on these short climbs and he’s won bunch sprints too which helps him harvest a lot of time bonuses and his experience means he knows exactly when to strike. He’s local which helps because this is a major goal for him rather than a pre-season warm-up. He’s got a strong team with Caleb Ewan but this could mean forfeiting a time bonus or two in the name of a stage win for Ewan. This year’s course is hillier so is this why Esteban Chaves starts too, are Orica-Scott parading him in front of the home crowds or is he humming after the Colombian summer and ready to pounce in Paracombe and Willunga? Riche Porte (BMC Racing) been runner-up for the last two years, each time taking the stage on Willunga but never being able to distance his rivals enough. You sense he needs to win this race once and for all, at least to finally land the rewards after trying so often. Now the course suits him more than ever with the hillier Paracombe stage but he’s still unlikely to place in the sprint finishes to poach time bonuses. Rohan Dennis won in 2015 when BMC team mate Cadel Evans was supposed to win. Lèse majesté maybe but certainly good racing as Dennis took advantages of the others marking Evans to jump and this again gives BMC options. Sergio Henao (Team Sky) was third overall last year thanks to his second place on Willunga. Geraint Thomas has been third overall here too, back in 2013 and the pair have a chance at the win. Henao seems the better pick but it’s a hunch based on his summer training schedule and Thomas’s ambitions for events later in the year. When Michael Woods (Cannondale-Drapac) attacked up the Corkscrew last year nobody knew who it was. We might blame cycling’s retro reliance on small paper numbers pinned to the jersey but even if a TV graphic had flashed up “Woods” within seconds most commentators would be none the wiser. Now we’ve learned his name but has he learned how to translate his prodigious power into wins? Paddy Bevin should be good for the punchy stage finishes while T-J Slagter has won this race overall. Dimension Data’s Nathan Haas could be good for a stage win, he’s often too generous in races, surging too soon in the finish but if he can become as clinical as Gerrans then his chances rise and via the accumulation of time bonuses he can place high overall too. Lachlan Morton‘s in form after a strong showing at the Australian nationals but would surely need a much more mountainous course to win overall. Rattling through foir teams Astana are led by L-L Sanchez who has shown in this race before but surely doesn’t have the punch any more to take a race like this; Movistar bring a strong team with Jesus Herrada as an outsider pick for Stage 2 into Paracombe and Carlos Barbero for Stage 4 but this is a crowded field; UAE Abu Dhabi have Ben Swift for the sprints and Diego Ulissi for the uphill finishes and a place on GC, the Italian has won a stage here before in 2014 but is now a captain of his team and can start his season more gently. Ag2r La Mondiale’s Domenico Pozzovivo has done well here before but the level of the race has gone up while Pozzovivo’s older now. Uni-SA have a strong team with Cameron Meyer in form. He’s supposed to have given up road cycling but is in form and in a happier place and he’s got the race craft for this, the question is whether his renewed focus on the track means he’s heavier when it comes to the hills. Finally to pre-empt any comments, Peter Sagan‘s aiming for Milan-Sanremo and the course is too hilly for him. He might fancy a stage but don’t bet on him winning overall. Instead Bora-Hansgrohe have Sam Bennett for the sprints too and Jay McCarthy as an outsider for the hilly stages, he’s won a stage here before. ETA is local time in Adelaide and these are estimates supplied by the race and note the variability in case you’re getting up early or staying up late. What to watch? 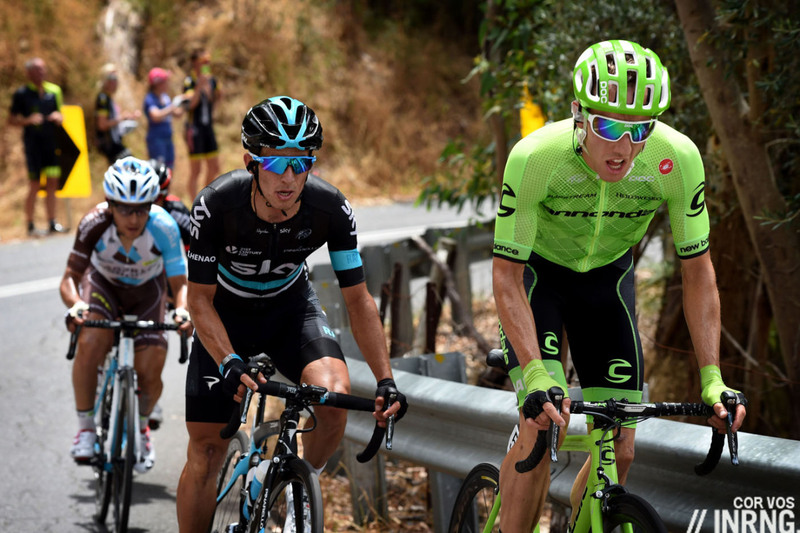 If the Tour Down Under was cuisine it would be tapas or kaiseki rather than a giant feast. Rather than gorging for hours on a single Queen Stage, aim instead to consume a little bit of each stage instead. Unlike a long classic or grand tour stage all the action and tactics come very late in the race, indeed you’ll rarely miss much if you tune in for the last 10 minutes each day. Where to watch? It’s on Australia’s Channel 9 and Gem and there’s a livestream page to watch on the web which normally works fine. As back-up British viewers can see it on The Bike Channel but it’s not live and there’s Universal HD and NBC Sports in the US. There is also the Tour Tracker app in some countries. Otherwise this marks a return to the furtive practice of watching via a pirate stream and cyclingfans and steephill.tv are the default choices. Coming from Euro time I find this race not worth waking up for in the middle of the night. Surely they would be able to draw in a significant amount of viewers from cycling’s European heartland if they were to reschedule the races to happen in the morning local time, say 4 hours earlier? -Reasonable late night for Euro viewers, +/- 1 A.M. finish. As much as we might like to have viewers outside of Australia and as much as Europe supplies the vast majority of the audience for racing during the season the numbers are likely to be very small. It’s better to aim for a big local audience and grow fans Down Under rather than chase foreign ratings. Perhaps in a perfect world the stages would finish at 7pm local time in front of a prime audience in Australia and breakfast for many in Europe? In an ideal world it would not happen in the same week as the Australian Open in Melbourne. A lot of the media attention is drained away by the tennis. Porte for the win I reckon. It’s not as if we Euros spend much time worrying about what’s convenient for Australian fans the rest of the season, so I think we can give them this race. I’ll watch it because it’s been too damn long since I’ve seen competitive cycling and am really jonesing for a fix. Plus I can afford to not really be at 100% for most of the week as far as “not being exhausted” goes. Coming from Euro time I find this not a problem. 95% of the time the overseas viewers have to struggle with our times, so it’s fair that once a year they have the say. What would make this race more attracting would be changing courses. every time Is see this race, it happens in the same area of this huge continent, always ending with Wilunga Hill showdown. That’s boring after watching more than 3 times. Anyway, I’ll take my winter nap till Omloop. It might be the TDU but it’s bankrolled by the local government hence being based around Adelaide. I’m often amused, and sometimes frustrated by the Eurocentric points of view shown by some commenters on this site. Usually coverage of TdU, anything in the Middle East, Asian or North American races have a few comments along the lines of “who cares, real racing starts with MSR” or whatever. And I get it, I guess. But this takes the cake. Well done. I am sorry if my need to sleep during my local European time zone offends you. Recommend you save your frustration over this though as it’s quite futile and will only needlessly increase your blood pressure. For what it’s worth, I don’t contest the merit of the TDU. It’s an established race with an obvious significant local footprint. I wish I could watch it, but I can’t/choose not to. My loss. My suggestion to move the timeslot to reach a global audience, as should indeed be the goal for any televised WorldTour (the clue is in the name) race was not meant to stir up your anti-European sentiments, my apologies. Perhaps I’ll spell it out for you then – it’s not about you, your sleep, or your television. Most of those ‘eurocentric’ views are more based on protecting the traditional races – big and small – and not superseding them with inferior races with poor parcours and little or no local interest (not to mention the regimes of some of the countries concerned). It’s not about geographical location, it’s about supporting the sport’s base where riders learn their trade, rather than chasing short-term cash. None of this applies to the TDU, though – and the European races aren’t run at times to suit other continents, so there’s no reason the TDU, etc. should be. I absolutely agree with such views about the Middle East as I’ve lived there and attended the ToQ. They don’t care whatsoever about cycling. I really don’t know about China, despite living now in Singapore and knowing there’re a lot of local cyclists here – perhaps there’s a market beyond Tour of Langkawi, although how stable that is I’m not sure. I guess the US and Australia would really like to build the domestic sport, using the stars of the World Tour, in the hopes that their cycling talent may not have to head off to Europe to ‘learn their trade’ so much. Maybe. WT status means local teams can’t be involved, though so… Oh well, all part of a bigger picture I hope. Interested to see a named sponsor noted for each stage on the profiles. A great event for those down-under to see some of the big stars live, in-person and for the rest of us to see the new kits, bikes, etc. for 2017. Beyond this, the biggest non-Australian name to win this thing has been Andre Greipel, so as a RACE I don’t see a lot of reason to bother. How many days until MSR? Hah! You KNOW that, don’t you, Larry? Even if he’s not targeting the race, it’s strange to see Sagan so far down the list of contenders. I would be surprised if the rainbow stripes weren’t visible all week, no? I know it’s not you Inrng as the images are no doubt grabbed from a guide, but for some reason in Australian tech guides seem to change the vertical scale of the course profiles provided for each stage, when they should all be set to the same vertical scale (suitable for containing the lowest and highest points attained during the tour) so that comparing stage profiles is visually easier. The way to think of it is what it would look like if the stages were strung together end to end. Same thing happen in other stage races here. One for the sponsors. Most teams seems to have not even bothered putting new group sets on yet. The season starts with Omloop as far as I’m concerned. I wouldn’t have even bothered to read were it not on the incomparable Inrng. Grumble, grumble… this is a super little race, especially for those of us who happen to live in this part of the world and rarely get to see the end of a cycling race on TV before 1am…. If you are a cyclist yourself, I strongly recommend making the trip one year; the atmosphere is really terrific and the riding is very good (if a little warm some days). The pros are generally very relaxed and I can’t think of (m)any other races where you can ride back to the city with them for 30-50kms after a race (if you can keep up and show a little respect for their safety). This is a harder edition than usual, stage 2 in particular. It all depends on how it is raced but I think, barring accidents, Porte and Henao are shoe-ins for the podium. 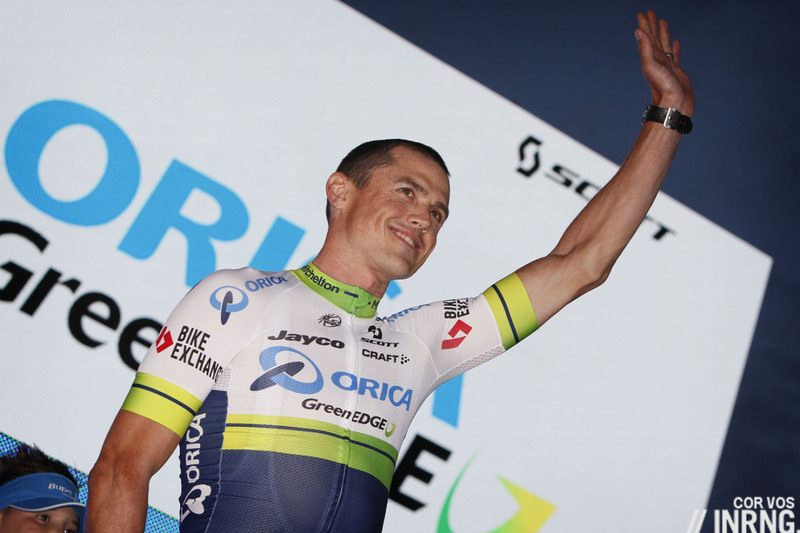 Gerrans didn’t seem his usual self at the nationals (he was sick over xmas) so I suspect ORS will go for Chaves. A real shame Brendan Canty (Cannondale) is a late drop-out due to illness: he has been in phenomenal form and would have been a real chance on stage 2. Finally, keep an eye out for some of the younger riders on Uni-SA: it’s a great touch to allow this “composite” team to race and I’d really like to see it in some of the major races in Europe where a national selector/coach gets discretion to choose a composite team of great local talent to experience “life in the big league”. There’s something that the UCI COULD do for the future of the sport. I had that sort of experience in the Giro di Lombardia (with those who retired from the race earlier on), Settimana Lombarda, Giro Donne, Volta a Catalunya and even some Giro stage. Yeah, cycling is a great sport. Italian coach Davide Cassani supported and then put into practice something like that, if I got what you mean. It was pretty much a mix (thinking about the Worlds, too? ), with more experienced riders like Viviani, Nizzolo, Felline or Puccio alongside the young Fabbro, Ganna, Consonni, Albanese, Ballerini, Affini. I guess that some inrng readers are starting to be familiar with some of the latter group, yet they’re still very young riders. I’ve done it both ways, riding and just spectating. I found it worthwhile in both cases. Without the bike the missus and I stalked the route in the car and cheered the peloton on at four or five different places then hit the end where the towns were pumping – Hahndorf was pretty great, for example, with a carnival atmosphere and huge crowd. I probably wouldn’t wake up at 4am to watch either but living in Adelaide means I don’t have to. It’s a good race to get the season started and works brilliantly with the Australian summer holidays. The races between the Omloop and De Ronde are the worst for Australian fans because of daylight savings differences. MSR can sometimes finish as late as 3am whereas Flanders and Roubaix finish at midnight-1am and Tour stages can be done before midnight. The possibility of evening stage finishes is interesting. I don’t think Mike Turtur would be bold enough to do it but maybe with a new race director it could happen. The course seem a bit tired and predictable though, especially Stage 6. There shouldn’t be a 90km kermesse procession in a WorldTour race. The finish for stage 2 includes a climb of 2.5km that’s feels harder than it should be and a 50-60km/h downhill into the 15% wall up to Paracombe. It should be a harder finish than Willunga and apparently those that are going for the overall see Stage 2 as more important that Stage 5. Most of the teams are on their new bikes but there’s been shortages of the new Dura Ace so there’s a mix of equipment. Previously teams have brought their old bikes and tried to sell them off cheap at the end of race. A well used Pinarello for ~2000 euro? Also Sagan has been training on gold wheels before spending the rest of the day at beach enjoying his appearance money. I think he’s more than capable of winning after following Cadel and Valverde up Willunga as a 19 year old neo-pro. But whether he wants to or has enough form to do so is another question. Just my personal opinion, but I’d never buy a used bike off a pro: they’re usually pretty badly abused during their short lives and are more likely to have hit the tarmac a few times and been “jet-washed” and stripped with pretty corrosive de-greaser a bit too often. I agree that, if ridden hard, stage 2 should be the decisive stage. Fully agree about stage 6 – there has to be some other kind of circuit – which the crowds can attend – which is potentially a bit more selective. Or, how about a road bike TT (up Norton Summit?) although that might be a bit cruel this time of year. It’s not so bad in a GT. Three weeks of hard racing followed by an easy acceptance of everything in a parade before a big crowd with a fanfare ceremony to finish off. That’s OK, I think. But in a race with six, five, even four stages then no, not at WT level. It’s something that seems to be associated largely with the newer races. TDU does it and Tour of Poland does it. The even newer WT races in non-traditional countries are even more susceptible. Beijing did it. Abu Dhabi does it; so does Dubai. I understand the argument about setpiece productions in front of big, or at least bigger, crowds but I think it shows a lack of imagination, a dull and over-cautious approach. This race-design-by-numbers mentality, repeated again and again, risks losing appeal and freshness in the longer term. Surely it can’t be beyond the wit of race organisers to think up a few other race scenarios that can deliver on-the-spot satisfaction to significant numbers of local sponsors and spectators? I think that Rohan Dennis will podium this week. He could surprise a few people this year too. Good question on the used bike wear issue? I would be curious to know if carbon fiber frames fatigue as we use to experiance with steel bike frames. Guess I’m showing my age, Larry T territory. carbon fiber sort of fatigues, but not really. it’s an all or nothing kind of material, when it reaches it’s maximum elasticity it just fails (usually catastrophically) instead of steels loosey-goosey nature. “fatigue” in carbon fiber usually takes the form of micro-fractures from small impacts, as those build up they can increase the overall likelihood of a failure. from my experience with used pro bikes isn’t so much frame issues, it’s the cables/housing, bearings, chain, cassette, chainrings, saddle that are totally blown out. team mechanics rarely do more than washing before shipment. For those wanting a race “fix” rather than Brexit or President Elect. The Bike channel has some pretty decent coverage among a lot of dross. The Soudal Cyclocross series and the TDU too. if they could just get it out on HD….. not that I’m fussy or anything…. 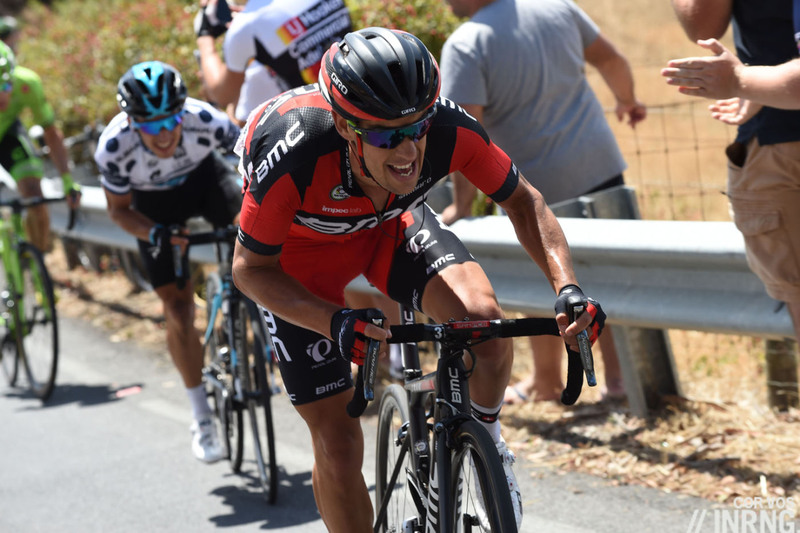 If Porte wants to win he’ll have to learn from previous years’ experiences and attack earlier on Willunga. He needs to be a bit daring if he wants to overcome the bonus seconds Gerrans (and maybe others) is likely to have in hand. What happened to Slagter? He looked so promising at one point. Looks like he just attacked earlier “than” Willinga.